To educate our members on motorcycle safety and maintenance. History: Women in the Wind (WITW) was founded in 1979 by Becky Brown. That year, Becky placed an ad in a local newspaper in Toledo, Ohio to find women who were interested in forming a motorcycle organization. Soon after, eleven women took their first ride through the scenic byways of the Maumee River. “We would ride on the back with boyfriends or husbands, or some of us were tomboys and rode dirt bikes, but once we got the bug, it was a matter of knowing how to find a bike that fit us and learn the rules of the road,” recalls, Becky Brown. In 1983, a second chapter of the WITW was formed in Chicago, Illinois. Throughout the 1980s, chapters sprang up across Illinois, Indiana, Ohio and Wisconsin. With Brown’s leadership, Women in the Wind soon grew to over 60 chapters around the world. 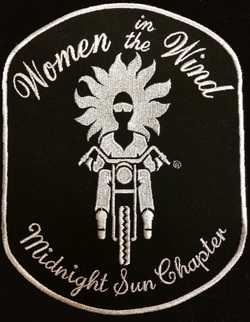 Today, Women in the Wind has grown to nearly 1,400 members and over 100 chapters in the United States, Great Britain, Canada, and Australia. 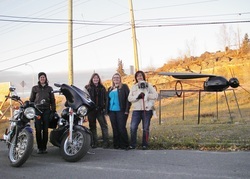 While chapter locations and members may change, Women in the Wind continues to strive to educate, unite and promote a positive image of women motorcyclists.